Yesterday one person contacted me on Facebook asking me whether there was any chance of me doing a “which usd-micro usb cable is best”, as there’s not much clear information on the Internet. His purpose was to charge his phone, but many development boards come with a micro USB port, and I’ve read many comments about powering the board. It also happened to me, and the main cause can either be the power supply which does not work as rated (usually 5V/2A), or the micro USB cable which may have a resistance a little to high leading to voltage drops. You’ll know you may have a power problem when the board refuses to boot, and usually boot loop, or randomly reboots especially under high load. 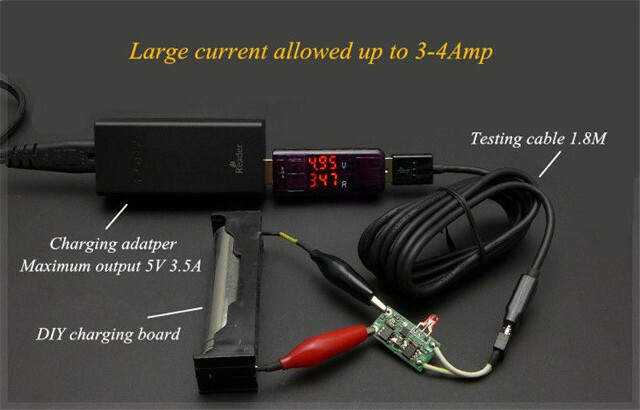 The first solution is to get a power supply that provide the right voltage and amperage, and you can test that with USB Charger doctor an ultra cheap tool that will show both the voltage and intensity on an LCD display, although it will only work on chargers with a USB port. But what about the micro USB cable? Let’s consider the actual problem, which is well explained in a post about USB cable resistance, but I’ll summarize below. First all conductor have some tiny resistance, and usually the thicker the cable the less resistance there is. The American Wire Gauge (AWG) value is often used to describe the thickness of the cable, with numbers from 0 to 40 ranging from the larger diameter/smaller resistance/higher capacity to the smaller diameter/larger resistance/lower capacity. For USB cable, AWG20 to AWG28 are often used for USB cables, and the latter seems to be very common for data wires, but what matters here is the AWG value for the power wires (5V/GND) of the cable. The resistance also depends on the length of the cable with longer cables having a longer resistance, as well as the USB contact resistance, but I’m not sure we can do much about that one. Anyway, that means a short cable with a lower AWG value would be better suited here, as shown in the table below from the aforelinked post using 5V/1A and 5V/1A loads. This table assumes 30 mOhms contact resistance, so the values would be lower if there’s a lower resistance. Boards can normally work in a range around 5V. For the sake of argument, let’s assume a board taking 4.5V to 5.5V DC input. and would reboot if the voltage drops below 4.5V. 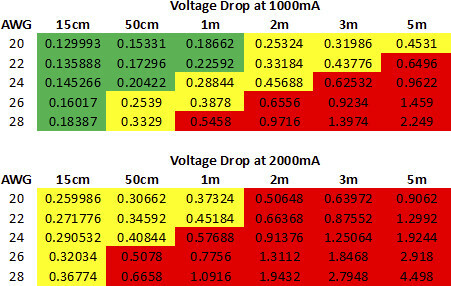 If you have a 5V power supply use with a non-optimal AWG rating and length, the voltage will drop more than 0.5V (red zone above) and the board will not work properly. 5V/1A (5W) is a very common on development boards, while getting to 10Watts is possible for you’d need a high load plus possible some USB storage device to reach the power level. KoPI 20AWG micro USB cable selling for $5.99 on Newegg. 5x Tronsmart micro USB cables for $8.49 shipped: 1x 6 feet (not ideal), 3x 3.3 feet (~1 meter), 1x 1 foot (33 cm). 35 cm micro USB cable (AWG20) for $2.99 shipped on eBay. It can also be found on Aliexpress for $2.49. There are many others, just search for AWG20 micro USB cable, or in some cases micro USB charging cables, and you should find decent cables that should not cause power or charging troubles. The last cable in the list above (eBay) was tested with a Charger Doctor dongle showing 4.95V/3.47A going through the cable (1.8 meter length). The voltage value should be lower when measured at the DIY charging board due the internal resistance of the cable, but it still shows the cable allows around 3 to 4 amps. It should be noted that approx 100% of all RPi 2 or 3 users are affected by this problem but simply don’t know since the Raspberry Pi’s ‘firmware’ masquerades the problem and in case under-voltage occurs simply throttles the CPU cores down to prevent freezes/reboots. 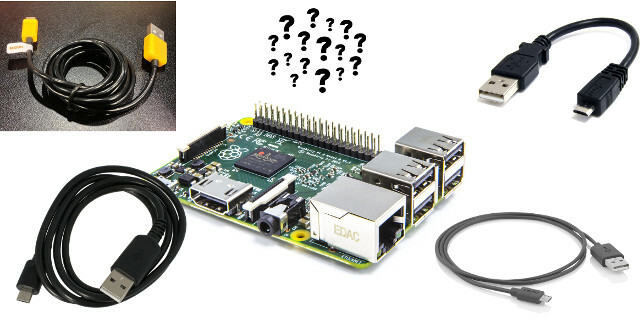 That’s why people using their RPi PSU and cable with other dev boards that are equipped with the horrible Micro USB connector (Pine64+, Tinkerboard, MiQi and some others) think those SBC would be failing while Raspberries are fine. perl -e "printf \"%19b\n\", $(vcgencmd get_throttled | cut -f2 -d=)"
Now that you talk about this, I’ve read the desktop UI displayed a yellow icon in case of under-voltage in Raspberry Pi board. While I agree that it’s not ideal, having a board that runs is better than a board that does not run at all. Would other boards be able to handle that, or under voltage detection is just not possible on most other boards? Some other SBC have some circuitry to measure DC-IN current and voltage (eg. most Allwinner A10/A20 boards with their AXP209 PMIC) but the majority not. And unfortunately most users of these Micro USB equipped boards are simply not aware of Ohm’s law and that so many stability problems they blame software for are related to PSU and/or USB cable between PSU and board. What’s even worse: When people run into these issues (freezes, spontaneous reboots) sometimes they fix it later by accident (buying a 10A rated PSU which is pretty useless but just comes with a cable that is not totally crap) but since now their installation/filesystem on SD card or eMMC is already damaged due to the many unsafe shutdowns they now run in software related stability issues and finally throw their boards away or put them in the drawer. The rainbow icon is the old one. THey’ve changed it since it was not really representative. Ah, thanks. I confused it (again). But I still rely on ‘vcgencmd get_throttled’ instead since the bits on the left side indicate that these events happened between now and last boot. So it would be pretty easy to inform every RPi user about insufficient powering or the need to improve heat dissipation to prevent throttling. Just use a shutdown routine in Raspbian that saves the firmware’s answer to the ‘get_throttled’ query and display a warning dialog on next reboot to the user. These are very good tips for cables. One question though, how do SBCs handle max current? Do they pull whatever they want, therefore maybe tripping over-current protections and rebooting the PSU circuit? Or do they look at PSU/charger type? So far I’ve settled on Ravpower PSUs w/ iSmart 2.0, as that applies voltage compensation over load and can handle the rated current without issue. On my HP Chromebook 11, 24AWG 1m cable can get 4.65-4.8v @ 1.5A, though it doesn’t draw more power due to charger type signaled. For RPi you probably want 30cm cables or AWG20/22 and it should be able to draw the full 2.4A. Devices that supply PSUs capable of [email protected] seem to use even thicker, AWG 18, cable with charge only wires. This has very little voltage drop but also needs very sturdy connectors so contact resistance isn’t the main issue. Isnt the above test setup useless? I mean the voltage is measured before the cable, not after… So not really any value in those (voltage) values. That’s mostly testing the power supply, and I mentioned the voltage value was not so useful, for wouldn’t the current be lower if the cable had some higher resistance? I also like to get USB charning cables with a ON/OFF power-switch on them for dev boards. That way you can easily power-off the dev boards without pulling out the cable. The switch is good, but those cable are most probably not 20AWG rated based on the price. One is also 1.5 meter long, so it may cause problems. sudo apt install -y stress stress -c 4 -t 15 perl -e "printf \"%19b\n\", $(vcgencmd get_throttled | cut -f2 -d=)"
BTW: One of the reasons why Apple chose to introduce an own proprietary ‘Lightning’ connector standard 5 years ago instead of adopting Micro USB is the same why they also sent truckloads of engineers to USB implementors forum technical commitee responsible for USB-C: since Micro USB is crap and not suitable to charge/power anything with higher current.